These are exciting times in Emo National school. No sooner have the witches, wizards and goblins along the corridors disappeared that we are now turning towards and looking forward to Christmas. It might be a bit early to mention it but we have to. Christmas concerts take place in the school every two years and this year’s concerts will take place as outlined below . Please read the schedule carefully and if for any reason your child will not be able to attend on the nights in question please let your child’s teacher know immediately as parts for the shows are being allocated at the moment. Monday December 10th 1st,2nd 3rd and 4th 7.30 p.m.
Tuesday, December 11th 1st,2nd 3rd and 4th 7.30 p.m.
Wednesday December 12th Junior Infants /Senior Infants /5th and 6th 7.30p.m. Thursday December 13th Junior Infants /Senior Infants /5th and 6th 7.30p.m. Preparation for confirmation has already started and the Parish and school request the help of some sixth class parents to volunteer and facilitate the “You Shall Be My Witness Programme “which will commence in the New Year . We need 8 volunteer parents from 6th class for whom training will be provided . You will also need to be Garda Vetted . Please let Mr. Costelloe know if you can help out. As November is the month of the holy souls , we traditionally pray for people who have passed on before us . The month began on the feast of All Saints on the 1st November and the feast of All Souls which is celebrated on 2nd November. We have set up a memory tree in school where the children can place the names of relatives that have passed on . We will remember them at assembly and in our class prayers over the next few weeks . The attendance for the school year up to last Friday was was 97%. Well done to all and we have 98 pupils with full attendance to date this year . This is the time when pupils are getting into their stride and bringing increased focus to their work. We find that the vast majority of our pupils are more than willing to embrace the high standards and expectations set for them by their teachers. When I visit classes we find that pupils are generally very proud of their work and love the opportunity to talk about it. They get this opportunity at assembly and relish the chance to tell the whole school about their achievements. Ms. Maher’s class are counting backwards from 10 and love dressing their ‘weather bear’ every day . Ms. Murphy’s class are learning new vocabulary as Gaeilge about food. They had an amhrán beag at assembly today. Perhaps they might sing it for you at home. Ms. Hooban’s class explained to me all about subtraction and are learning some animal walks in PE to improve their strength and coordination. Ms. Greene’s class are learning all about the brain and could list many new facts when I visited them this week. Mr. Slevin’s class displayed their beautiful chalk art at assembly and are learning about the Stone Age . Ms. Maher’s fourth class are looking at Ancient Rome ,they showed me their lovely tessellation art and are working on fractions in Maths . Ms. Lewis’ class sang “Hit the road Jack ” at assembly today. They did gymnastics in PE this week and were able to tell me all about the mountains in Ireland . 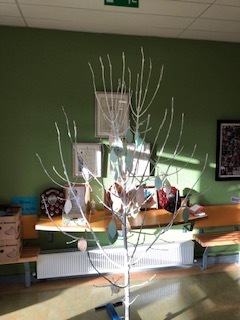 Mr. Costelloe’s class introduced the memory tree to assembly today. They explained to me how they are focusing on being more descriptive and expressive in their recount writing . Mathletics is ongoing and our teachers report that children really do benefit from the extra time they spend at Maths .It reinforces key concepts in a fun and engaging way. Many thanks to parents for facilitating same. Our annual subscription comes up for renewal in January. We will continue to renew the subscription (€6 per pupil ) of those pupils that are engaging with Mathletics every week.This week we presented 19 silver certificates and 8 gold certificates. Food Dudes is a programme developed by the University of Wales, Bangor, to encourage children to eat more fruit and vegetables both in school and at home. It is based on positive role models (the Food Dudes characters), repeated tasting and rewards. Junior , seniors and first class children have engaged brilliantly with the programme . The remainder of the school will engage next Thursday,15th November . It’s an opportune time to reinforce the healthy lunch messages in a positive way for the children. Please take the opportunity to have a look at our healthy lunch policy on our website at this link. Míle buíochas to Mr. Slevin for coordinating our Food Dudes programme in the school. Parent teacher meetings are being organised at the moment in the school. It’s an extremely valuable opportunity for parents and teachers to get to know one another and to exchange information which enables us to do our best for your children.We thank all parents in advance for their attendance. We request that parents keep to the allocated time for their meeting . Next Monday 12th November is the last day for orders to be taken for Christmas cards so please return your order form if you haven’t done so already. The Parents association are working on a school calendar for 2019 at the moment and we need your consent to publish your child’s photograph. Please return the consent form to the school on Monday 12th. The Christmas Shoebox appeal has been extended by a week so the closing date is Friday 16th. Our football leagues for 2nd ,3rd and 4th classes will finish on Monday.